Online businesses now have a wealth of digital tools and techniques at their disposal to help them get noticed in the global marketplace. 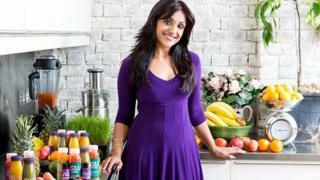 Geeta Sidhu-Robb, founder of juice and health food delivery service, Nosh Detox, was using social media to promote her business long before it became fashionable to do so. Ten years ago, in fact. On a tight budget and needing to convince a sceptical public, she tapped in to the power and reach of bloggers to promote her diet and wellbeing products. "Juice fasts didn't really exist in the UK at the time," recalls the former corporate lawyer and single mum of three. "In fact some people actually thought a detox could kill you." "We couldn't afford PR [public relations] agencies or expensive advertising campaigns, so we'd talk to pretty much anyone with an online presence and persuade them to take photos, film us on YouTube and write about us," she says. The bloggers would include a link to her website on their pages - occasionally in return for some Nosh Detox freebies Ms Sidhu-Robb admits. This helped push the business to the top of organic - not paid-for - search rankings. A £2m turnover and Hollywood A-list clientele followed, along with significant followings in Russia and Australia. It shows how, on social media, a little can go a very long way when it comes brand promotion. Now social media marketing is a business in its own right. Convenient and low cost, with a potentially vast audience reach, the platforms have overtaken all other media for small businesses, says research firm BIA Kelsey. Former investment banker Isabelle Ohnemus has extensively used "influencers" to promote her Zurich-based fashion company EyeFitU, which is an online platform aimed at remedying some of the sizing inconsistencies across fashion brands. Usually young, fashion-conscious females with a prominent online presence act as "brand ambassadors" for EyeFitU, promoting the company to their followers on Instagram, Snapchat or Facebook. Big brands will sometimes pay in excess of $30,000 (£23,000) to such influencers for a single post, but smaller companies with more modest budgets can still get in on the action. "There is a trend for going with smaller-scale bloggers rather than those with million-plus followers," says Ms Ohnemus,. "Having those kinds of numbers doesn't necessarily mean a higher number of conversions." In other words, it's the quality of the following not the size that matters. People who trust an influencer's opinion are more likely to buy the brand's goods, she says. Of course, there are rules governing this sort of social media influencer marketing, so you have to be careful. A spokeswoman for the UK's Advertising Standards Authority tells the BBC: "Our current codes state that if an advertiser gives payment to a social media influencer - this can be in the form of a monetary payment or a freebie - and there is control over the contents of the ad, the social media post would be considered an ad; thus the influencer must clearly indicate somewhere on the post that this is an advertisement." One of the main advantages of an online business compared to a traditional bricks-and-mortar shop is the amount of data you can gather about your customers. You can find out which search words people use to find your business, for example, which images they respond to the most, and which website content they share on other platforms. This all helps to refine and target your marketing efforts. Free monitoring tools, like BuzzSumo and Metrixapp, not to mention Google Analytics, are all powerful helpers for the small business. Vikas Shah, visiting professor of entrepreneurship at the MIT Sloan School of Management, says: "You can easily start by using many free SEO [search engine optimisation] tools on platforms like Google and Twitter, and because this activity is very much results driven, you will see a fairly robust relationship between spend and return on investment." Gourmet Meat Club, an online provider of free range British meat, is one of the 54% of websites globally using Google Analytics to delve into customer quirks. Recent insights reveal that Android mobile users visit more web pages than those on an Apple phone, and images of cooked food generate more views in a digital ad campaign than images of raw ingredients. Furthermore, the technology tracks the most popular food searches online, giving Gourmet Meat Club the opportunity to create content based on the very latest trends. How can you help your local online business go global? "It's crucial to act fast," says Stuart Cordingley, the firm's managing director, "jumping onto popular searches as soon as they emerge to get ahead of the competition and be present where the public is discussing its new favourite food topics." This is the best way for the brand to get "ample exposure", he says. Data is now "central to the marketing mix". This up-to-the-minute content is sent to journalists and shared on the firm's own Facebook and Twitter pages. Social media marketing expert Andy Barr says it is an example of how online businesses are increasingly morphing into social media communities, creating content that positions them as authorities on particular topics. But he also advises supplementing this approach with social media advertising. "As a general rule of thumb, it's worth spending between 7-12% of your total monthly revenue or income on social media promotion for the best results," he says.